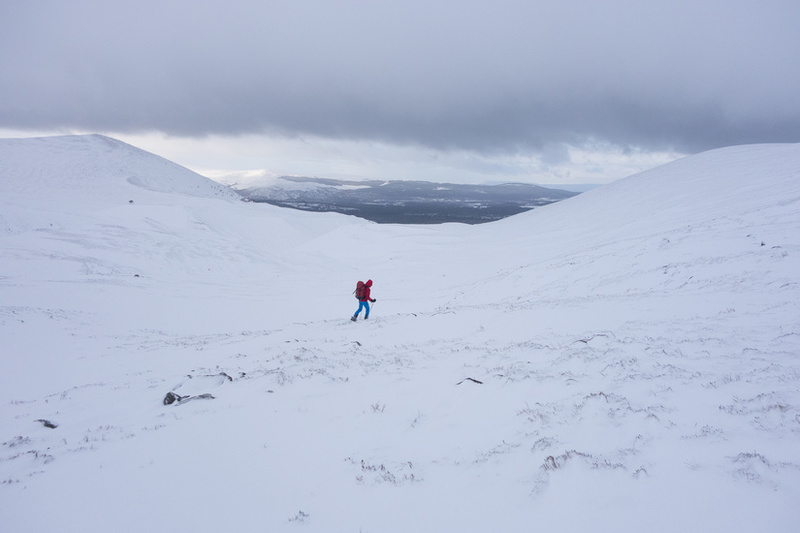 I had made plans with Nick to head up to Scotland for some climbing this weekend, however the never ending snowfall all week made that seem unlikely due to arduous and dangerous approaches to the climbs. 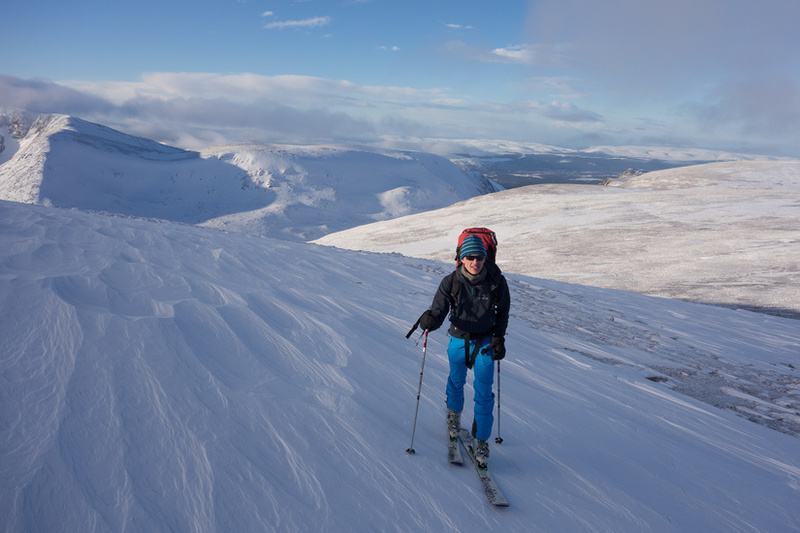 We are both capable skiers and decided that this would be a good opportunity to learn to ski tour, especially as the forecast for Saturday spoke about Alpine conditions. 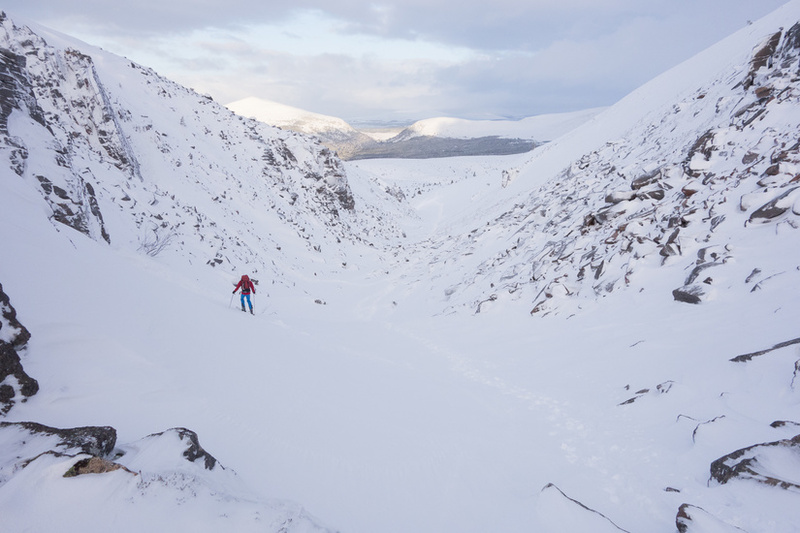 Nick and I have a history of not doing things in half measures (two years ago we climbed Orion Face, Tower Ridge and Point Five in a brilliant weekend while camping at the base of the north face of Ben Nevis). 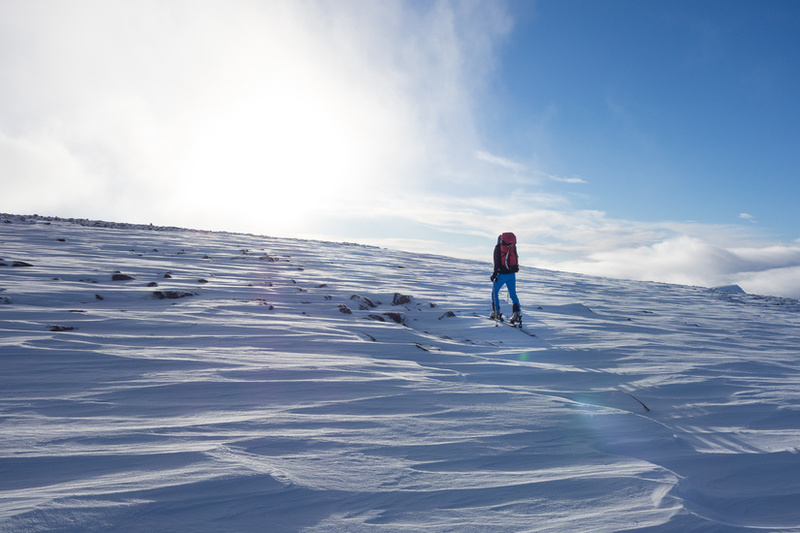 This was no exception to that, as instead of doing an easy day tour to learn how to do it, we decided to do a two day tour and attempt to climb all five of the Cairngorm 4000ft peaks. 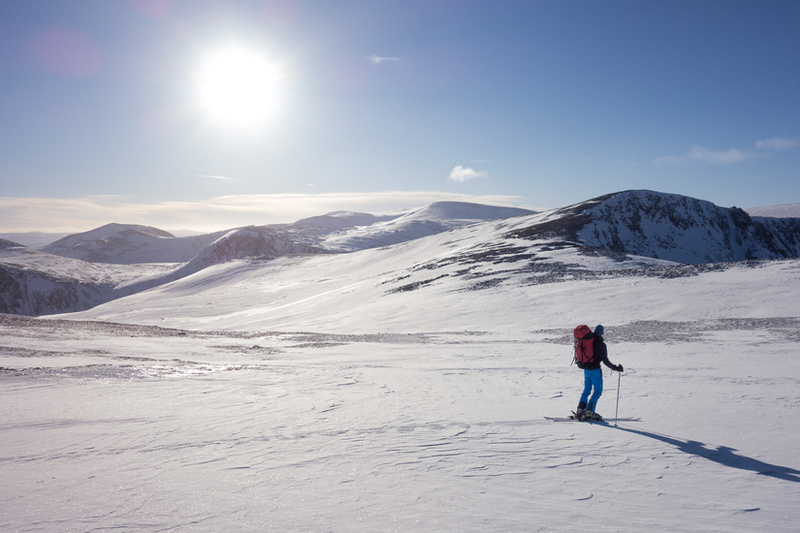 After a slow drive up to Aviemore after work on Friday we hired kit early on Saturday morning and headed to cairngorm mountain where we avoided looking to stupid as we skinned up the side of the ski lifts. We were soon at the summit of the funicular and were able to leave the crowds behind, by this point the sun was looking very close and we were looking forward to getting into it’s warmth. 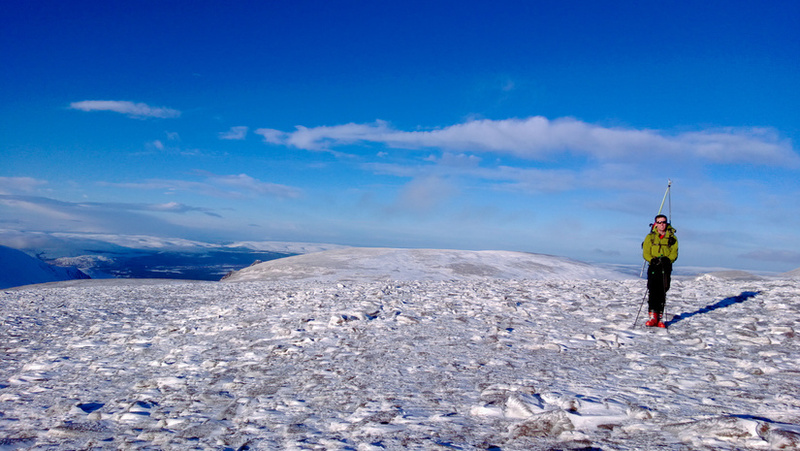 We managed to skin almost to the summit of Cairngorm, but due to the wind scouring the summit was fairly snow free. 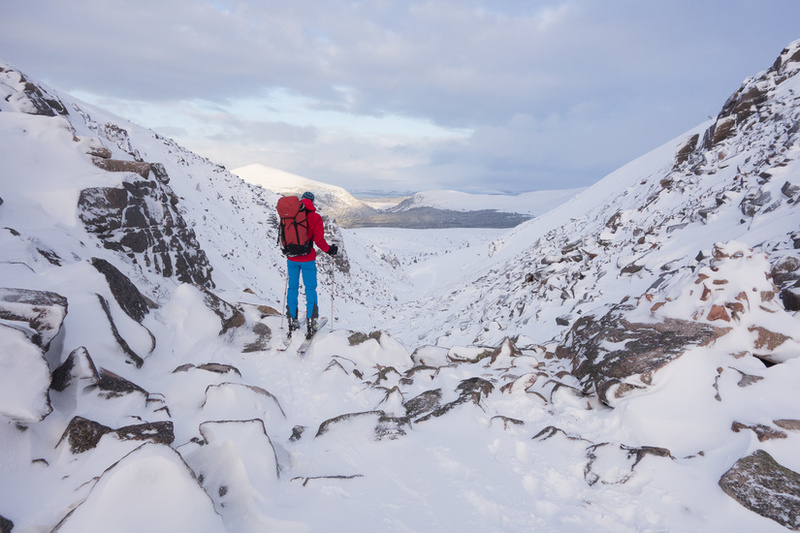 After a quick snack where we enjoyed fantastic views, we headed down towards the snowy plateau and enjoyed our first descent of the day down into Coire Raibeirt. 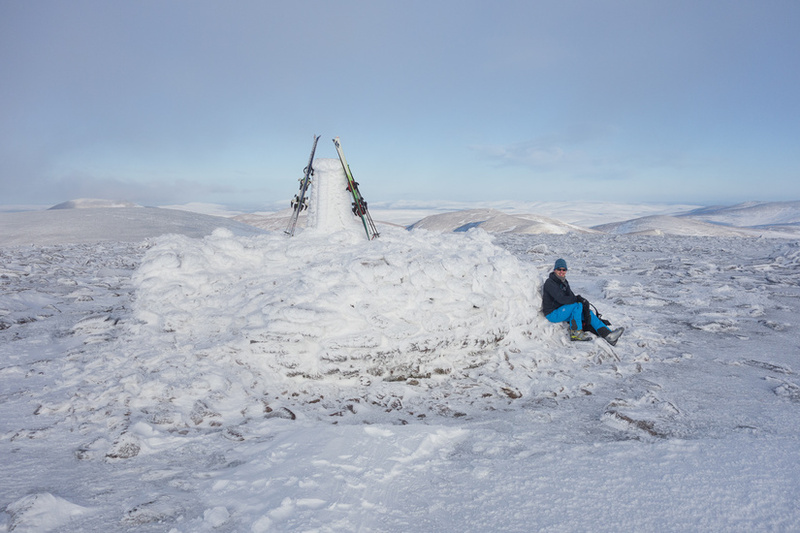 After some more skinning and a bit more walking we were soon at the top of the goat track where we joined the crowds that were out walking and climbing, from here we had a long skin up to Ben Macdui where the sky was almost cloudless and the wind was hardly noticeable. 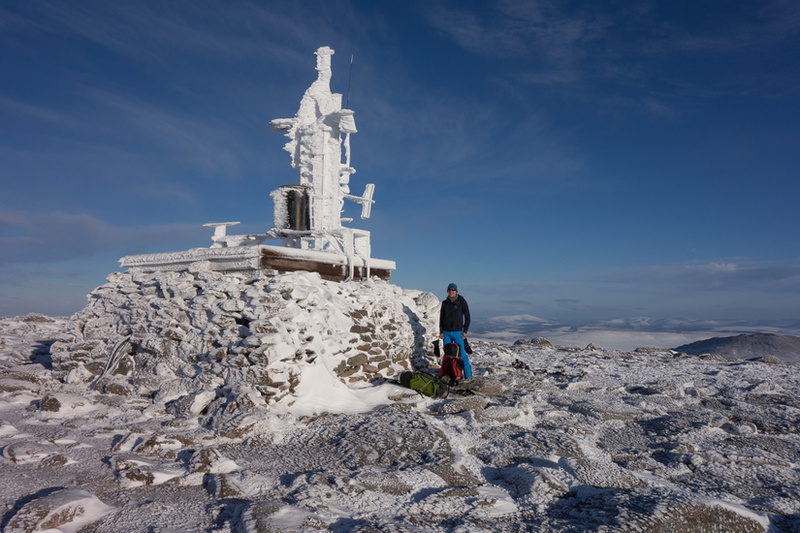 We made good time (we think) across the plateau and we were soon at the summit of Ben Macdui, we only had to walk for one short section and for the final 20m towards the summit. 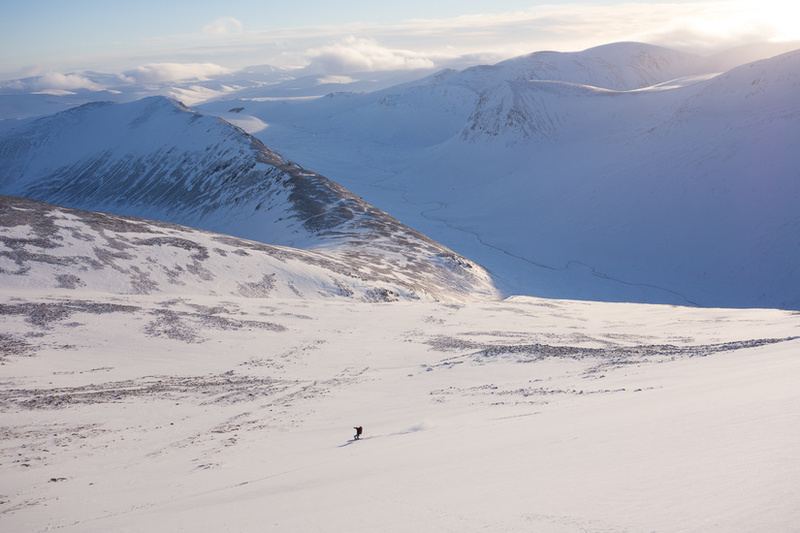 The views from the top were again outstanding, but we quickly made our way off so that we could enjoy the descent down into the Lairig Ghru in the setting sun. 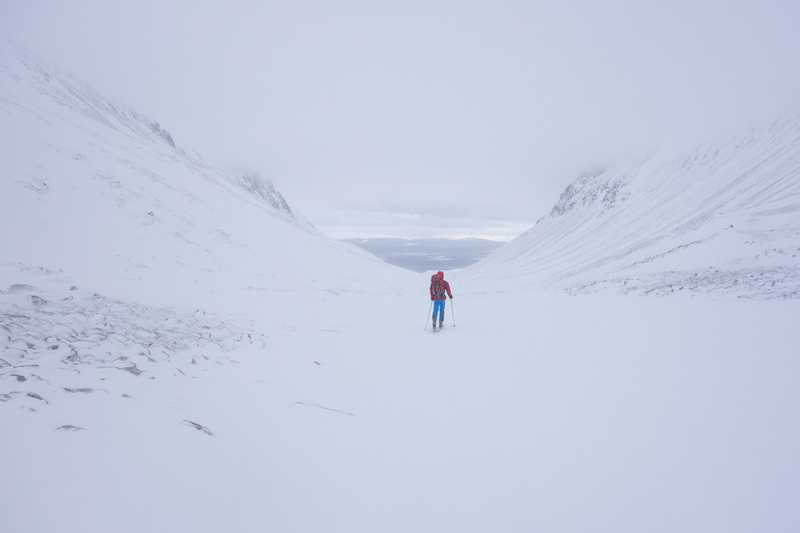 We found line of snow which started about 20m below the summit, the first section was very icy and certainly made me focus as I this was the first time I had properly had to edge on these skis and the first time I had been on icy ground with a heavy rucksack. 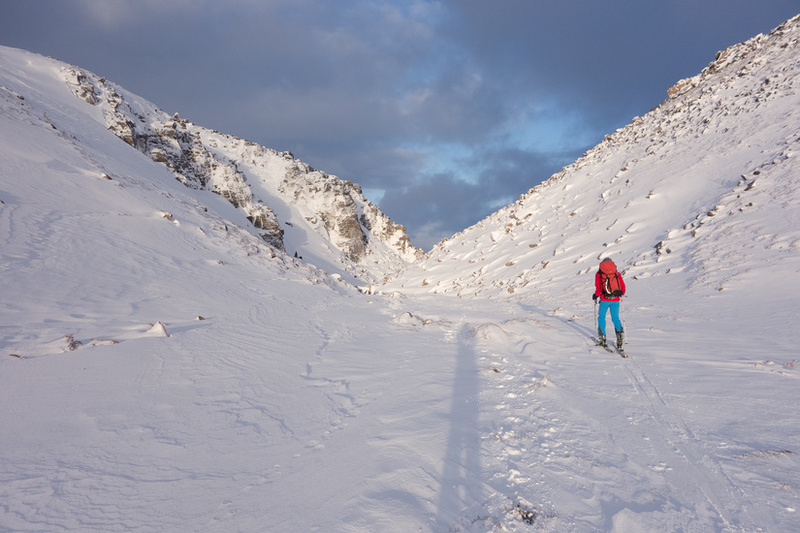 After the short but exciting traverse we joined some brilliant snow which then went all the way down into the valley 700m below us. Suddenly it all seemed fairly steep and the first turn was very intimidating, however once I had committed to it the rest of the descent was just fantastic. 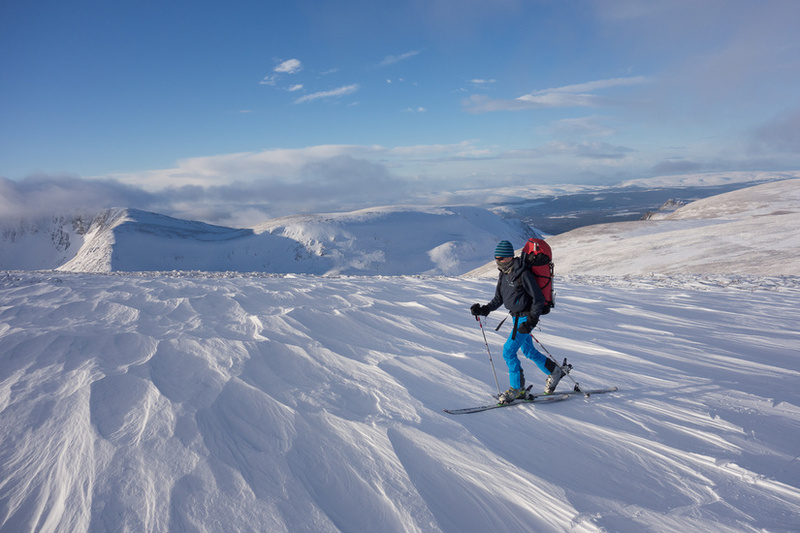 Heading down a remote ski descent 700m long ski decent, on great snow all the way to the valley was just fantastic, and for it to be in Scotland was even better! 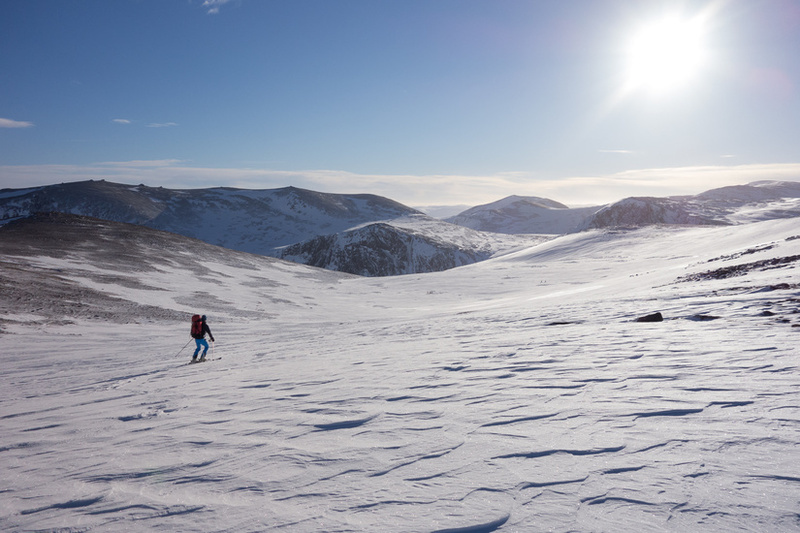 During this descent I learnt how tiring it is descending on skis with a heavy pack on (combined with some poor technique) and by the time we got down to the Lairig Ghru my legs were like jelly. 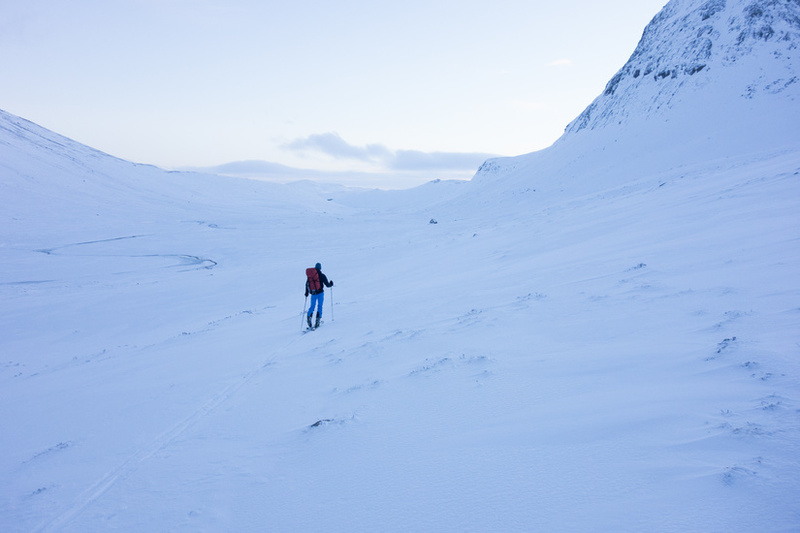 As we descended we headed down into the very cold valley, even the light was cold! 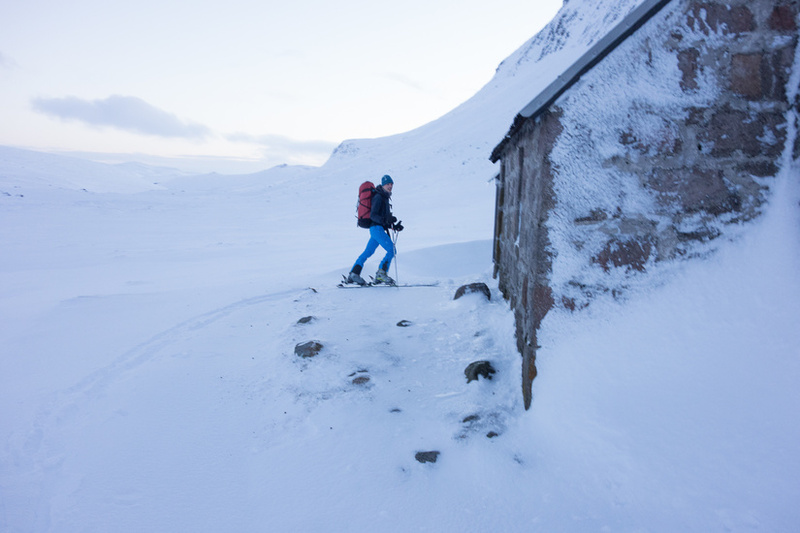 After a slightly dodgy river crossing we skinned down to the Corrour Bothy, we approached to find to door covered in snow so it was quite clear that no one else had been there for a few days. 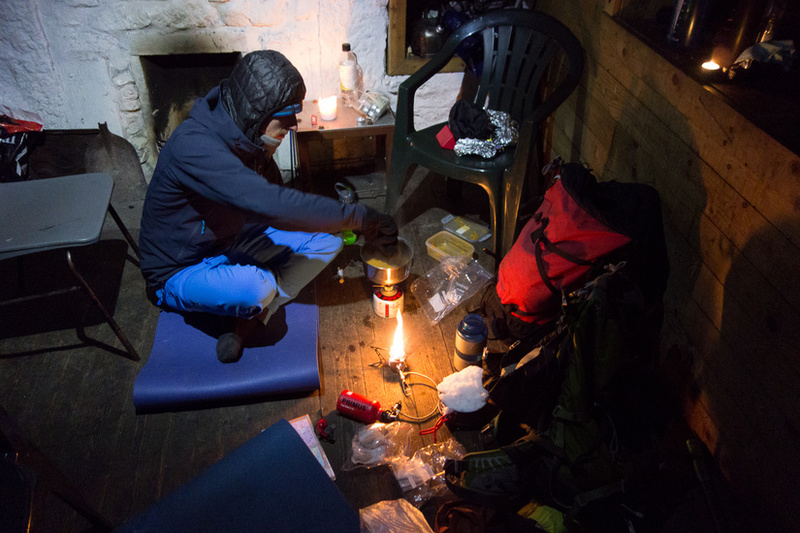 During the evening the temperature dropped and the wind picked up, but as we were melting snow and cooking for so long we did start to warm up the bothy. We were very tired so headed to bed pretty early which meant that we had about 11 hours sleep which was pretty good and needed after our drive up from Bristol the previous night. 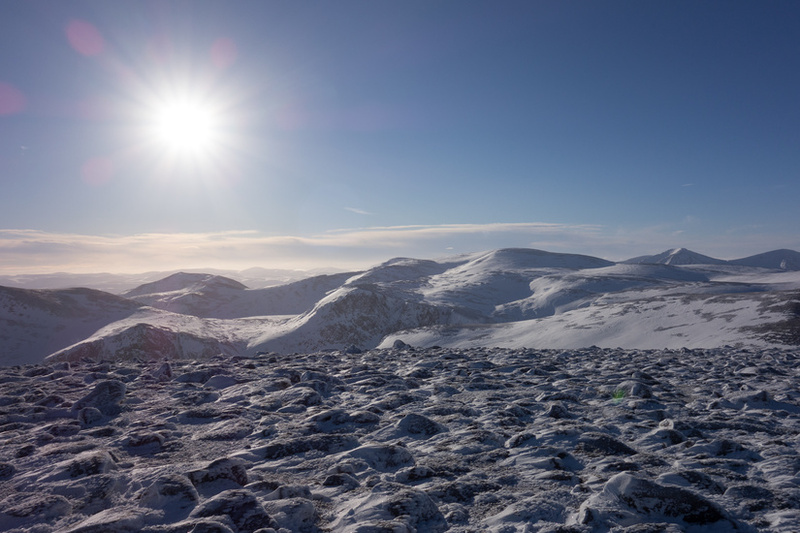 We knew that the weather was not going to be as nice on Sunday, but the forecast got significantly worse on Saturday (although we didn’t know). 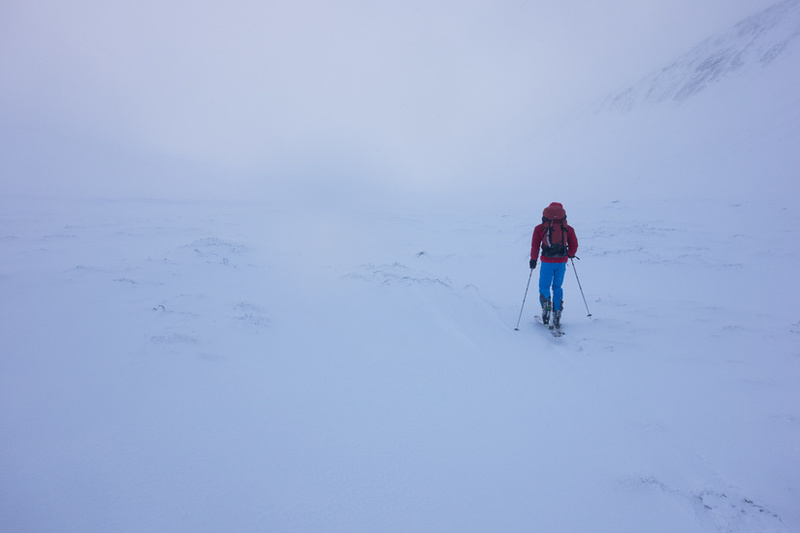 We woke up to blizzard conditions with a strong northerly wind whistling down the valley and blowing lots of snow with it. We didn’t initially bail on our plan to go around the back of the Devil’s Point to avoid the loaded slopes of Coire Odhar, however as we got to the start of Glen Geusachan we decided that it was not going to be sensible to head up onto the plateau again due to there being no easy escape route once up there. 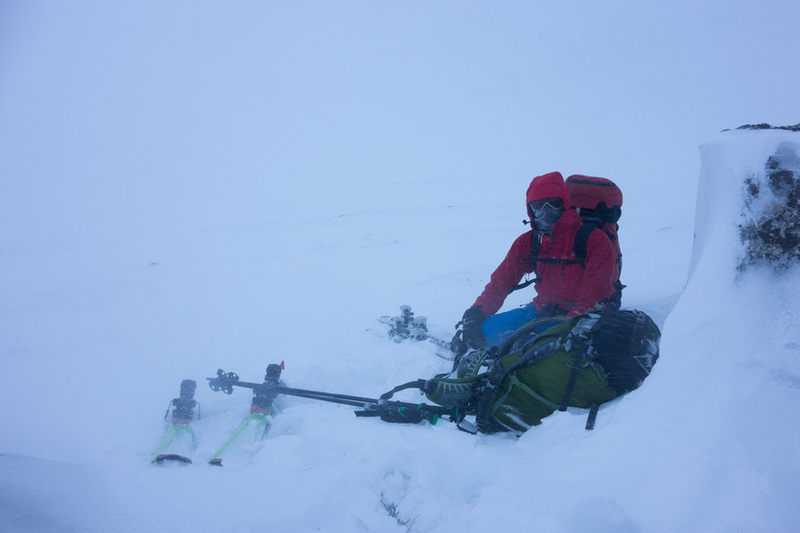 Due to this we had to head up the Lairig Ghru which sounds easy given our plans for the day, but when you are heading directly into a 40mph wind which was gusting to 60mph even progress on the flat was challenging! 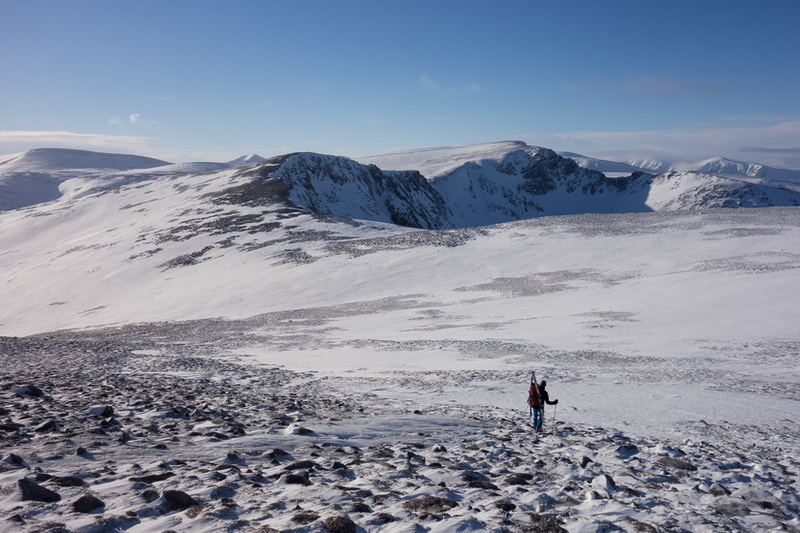 During our ascent to the top of the Lairig Ghru we were both blown over multiple times, thankfully by the time we (finally) got to the top and the start of the descent the wind had died down. 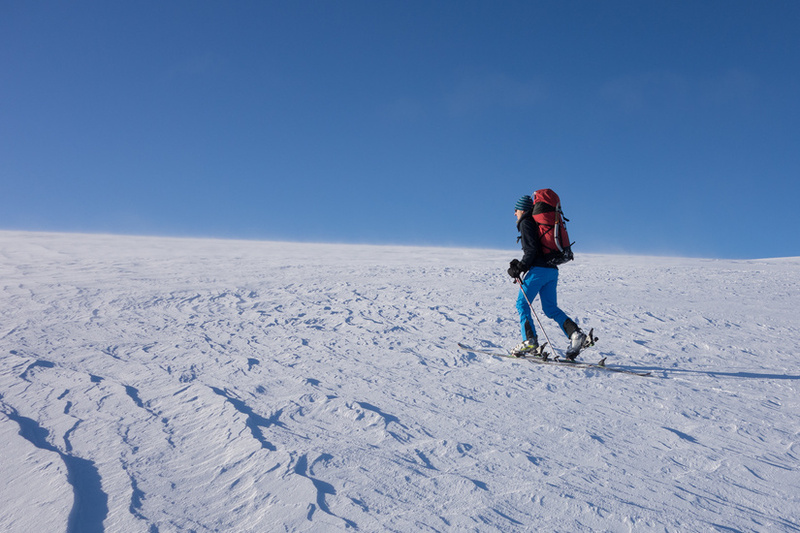 Unfortunately the descent was wasn’t steep enough to allow us to ski down without working, however it was enjoyable and significantly easier than the ascent! As we were descending the weather started to improve and the views were great, the sun even came out as we were approaching the Chalamain Gap. 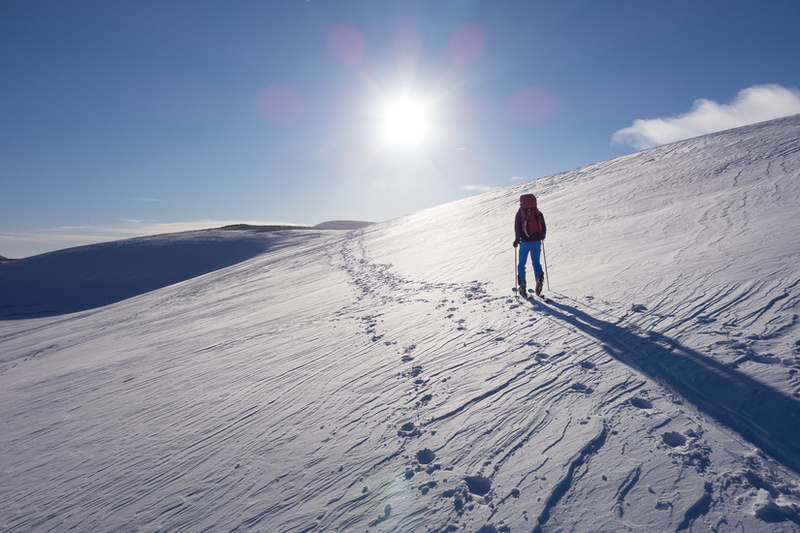 The gap was so full of snow we were able to easily cross it on skis, judging by the depth of some of the footprints it would have been pretty unpleasant on foot! 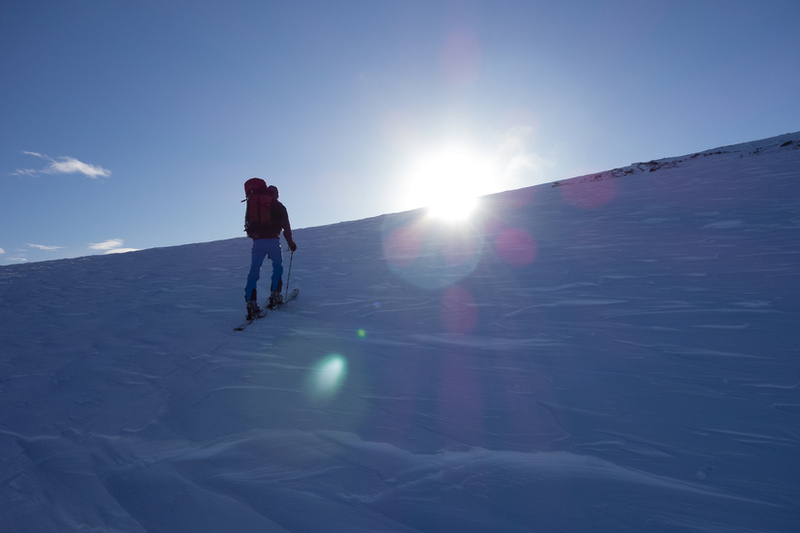 We even got a few turns in on the descent, from the base of the gap we then skinned back across to the ski resort car park, I was knackered when we arrived and very glad to take the poorly fitting ski boots off my feet. Given that it was 4pm when we got back to the ski centre and that knackered due to the distance we covered combined with the effect of the heading into gale force winds all morning, I am glad that we made the sensible decision to abort and head up the Lairig Ghru, which was certainly not a short, insignificant or unworthwhile escape route. 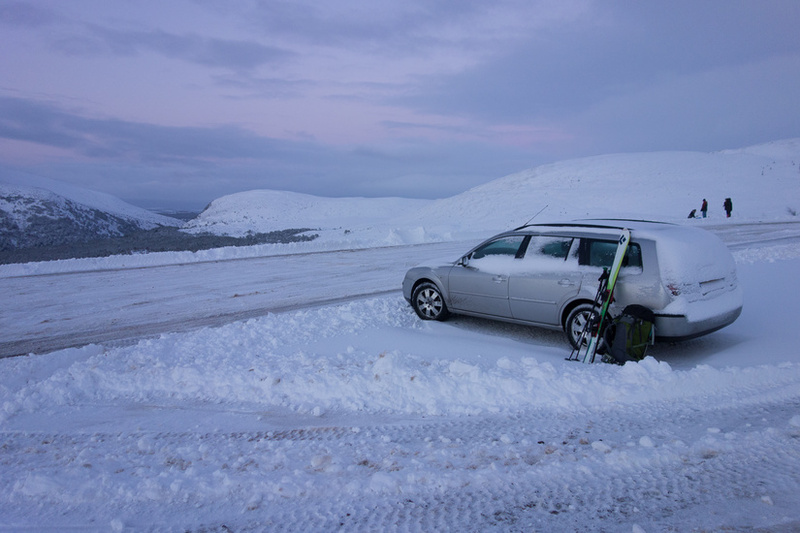 When we got back to the car at the lower car park, it was fairly clear that a not insignificant amount of snow fell over night and that my car had been in the way of the snowplow. This made getting out of the car park slightly challenging, but we were soon back in Aviemore enjoying a coffee and planning our next trip. Wow, Alastair – great trip! It’s not quite believeable that you can find this sort of trip in the UK and still be back to work on Monday morning. Keep up the good work on the blog. I’m the climber you saw dangling in the Chalamain Gap and the owner of some of those super-deep footprints… Very envious of your “more appropriate footwear”. 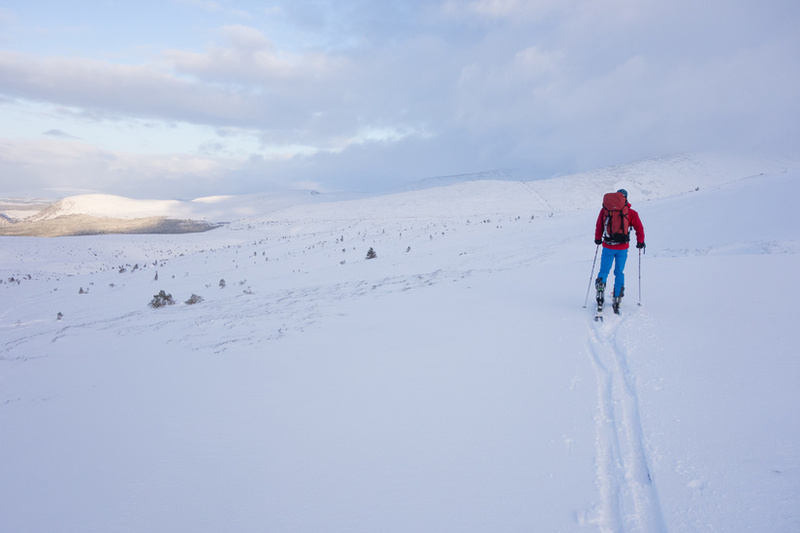 Good effort on the ski touring, you didn’t look like beginners! 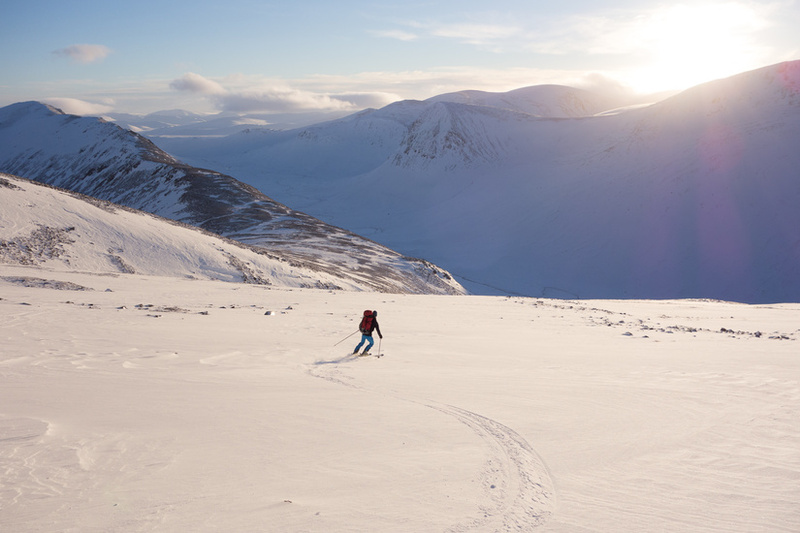 I did wonder how you guys had found it after hearing your plans in Aviemore at the ski shop. Good effort! Just read the trip and it’s epic. 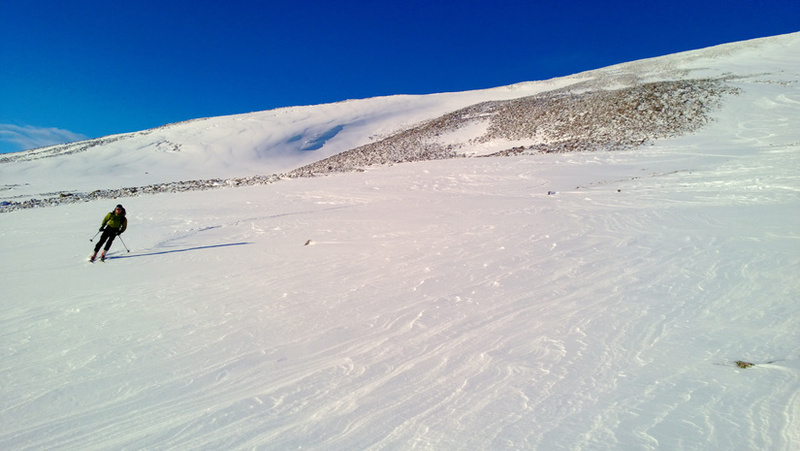 I work for FATMAP and we are releasing an App of 3D ski routes for Cairngorm. Would you like it to include yours or do any writing for us?